If you’re in the Florence area and you need new tires, get in touch with Kerry Toyota and come check out our tire service specials today! Seasons change, roads undergo construction, and time wears on – and wears out your tires! The recommended interval for changing the tires on your car or truck is every three to four years, or every 50-60,000 miles. Of course, life happens, and sometimes you need to get a tire replaced sooner than that. A stray nail or a fender-bender might find you looking for a tire shop, and then the questions start: should you go to a dealer’s shop or independent shop? Should you get OEM tires or aftermarket tires? 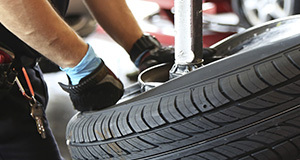 In our experienced opinion, your best option for high quality service and reliable, long-lasting tires is to go to a licensed dealer and use OEM parts. At Kerry Toyota we employ certified professionals to work on your vehicle. When you come to us, you can rest easy that you will be taken care of with skill, expertise and professionalism. We also serve all makes and models of cars and trucks, not just Toyota! When you need someone to put your trust into, give Kerry Toyota a call or stop by our dealership, near Fort Mitchell. When you get a tire replaced, just like any other service, naturally you will want to feel sure that you’re getting the best bang for your buck. At Kerry Toyota, we believe in quality over quantity. We pride ourselves on trustworthiness and in building a long-term relationship with all of our customers! We want you to be happy with your experience and with the work we do on your car or truck. That’s just common sense! That is why we at Kerry Toyota use only OEM parts, including tires, when we work on your vehicles. In case you’re wondering, OEM parts stands for Original Equipment Manufacturer parts. What this means is that these parts are made by the manufacturer of your vehicle, for your specific vehicle. Unlike aftermarket parts, there is no question whether they will be the right fit for your car or truck, and there is no question of their quality. The quality of OEM parts is assured and backed by the manufacturer of your own vehicle. If you have any questions or would like to schedule an appointment, we would love to hear from you!